When you are overweight by more than a few pounds it is more difficult to move about and it seems like all the exercise programs are designed for people who are already fit! Watching a 20 year old bouncing about in their tight spandex outfits can be more discouraging than helpful. Having tried and failed on several weight loss attempts can eat away a persons confidence too. How do you deal with a new way of eating and living after years of ingrained habits? Losing weight IS a BIG DEAL and you need to become skilled a a whole bunch of new things. There are the people in your life that may be less than encouraging. Not to mention your own inner voices that tell you things like you should lose weight BEFORE joining a gym, or providing you with an endless list of excuses to never start. Saying things like “After the holidays will be better”. Is part of you afraid that you might succeed? If you do will it take away your wall you’ve been hiding behind so you didn’t have to let people into your life and would rather be alone with your TV and Doritos? Even through all that, here you are, ready to try again. Since your physical health is at the foreground for losing weight its a good idea to get a checkup before you do anything radical. No doubt the doc will agree that you should drop the excess fat but there may be other considerations too. S/he will want to monitor your sugars, blood pressure, pains and strains. If they are less than encouraging or not particularly helpful with advice, you may want to consider including a personal trainer and nutritionist into your new life. Jumping jacks and sit-ups are out of the question. Most of the gym machines aren’t made for anyone who is obese. Plus you finally got the courage to go to the gym and all you can see are rows and rows of mirrors. You peek into the aerobics class and there’s the 20 year old again. Bouncing about in her tight body wrapped snugly in her spandex. At this point its good to remind yourself that you’ve already completed the first step to losing weight which was the decision to lose weight. Now you just have to find something you can do. Even if it’s just for a little bit. When I first started I could not do a full five minutes on the stepper. My heart was going to pop out of my chest and I could hardly breathe. That was on day one. Fortunately the body adapts quickly and in very little time you will see rapid changes in your abilities. Find stuff you can do. Go for a walk. Sit on a bench and do some lightweight dumbbell curls. Sit on the bench and stand up then sit again. Maybe your feet will hurt and muscles will ache in places you didn’t know you had. If you find it really difficult to move about there are walkers you can purchase or rent to help you with your mobility. Another option is chair exercises and other exercises you can do sitting down. 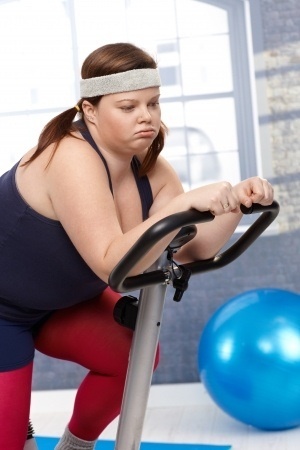 Most gyms have an exercise area made purposefully for beginners and obese persons. This area is often tucked away from the regular iron pumping grunters – simply to allow for privacy. These are usually machines that you can vary the weight and use safely. Sometimes they are set up in a circuit so you can exercise your total body by moving from one machine to another. Another activity that will burn off a bunch of calories and still be easy on your knees is water exercises. Understandably you may be feeling a little shy about being seen by others in your bathing suit but be assured there are others there who started out feeling the same way. If you need additional encouragement, ask if you can “pop in” to a water aerobics class already in session. Stick around and talk to some of the people in the class. You’ll see how quickly you will feel welcomed to join. It’s easy to find reasons to get discouraged. Try to remember that every journey begins with the first step. Maybe you will have to begin each day with the same decision to become fitter and healthier. That’s ok. If you have to reaffirm then so be it. If all you can do on the first day is 10 minutes – then do 10 minutes. Come back and do 10 tomorrow, and the next day you will see you can do 11. Jim Rohn Talks about “making miracles”. He says that a person can make miracles by doing their best. Then rest a little (not rest a week or a month but just a little) then do your best again. For example; if your best means you can only do one pushup then you should do that one pushup. Rest a minute then do another pushup. Pretty soon you will see that you actually did 10 pushups. Then soon you will be able to do 10 pushups before you rest. Then do another 10. You will notice very quickly how you will adapt to exercise. With this “miracle” comes an increased metabolism too. This means that the more you do, the better you get at it, the faster you will burn calories. You really and truly do NOT need to workout like a madwoman or madman to quickly see results in your weight loss. The shows like The Biggest Loser are fantastic for motivation and methods but keep in mind that the contestants on these shows are carefully screened AND there are doctors and other medical professionals on standby at all times. Your priority is to take care of your body so you can continue with your long range plans of living a full and healthy slender life. Getting motivated is one thing. Staying motivated is a different thing. One way to use motivation to your advantage is to know yourself. What works for you and what works against you? Personally I have little to no motivation and yet I still get things done. They way I do this is to mitigate my weakness’s. For example I know I have ZERO motivation to stay out of the chip bag when I am home. I know that if there is a bag of chips in the house they WILL get eaten. If there is a large bag it will get eaten. If there was a three for one sale on party size bags of chips – they WILL get eaten. Not one smidgen of willpower is available at home. Knowing this I can exercise a few minutes of willpower while at the grocery store. So rather than try and exert hours of willpower telling myself not to consume an entire bag of chips at home, I need only a couple of minutes while at the store. Another example is I know my willingness to exercise is strongest in the morning. After work it is just too easy to tell myself I am tired and deserve to sprawl across the couch instead of stopping off at the gym. Here is what works for me and can work for you too. 1. Pack the gym-bag in the morning. 3. Stop at the gym on the way to work and lock up your gym bag and house keys in a locker. 4. After work you will have to stop at the gym to retrieve the house keys so it is easier to motivate yourself to exercise since you are now already there. Writing everything down may work for you. If you are the type of person that likes to record progress and log everything then you should run with that. It can be everything from just detailing workouts with weights and duration all the way to how you felt both physically and emotionally. You can include statistics like heart rate, blood pressure, body fat tests, body weight, measurements, and so on. You can use this journal to do assessments at the end of the week so you can schedule more challenges for the coming weeks. Things are going really well then you take a day off. Maybe you get the flu and you are forced into a reclining state for a week or so. Now it feels like you have to get started all over again. You still feel a little weak, you get winded easier and are wondering if all your hard work went down the tubes with the runny nose tissue packs. Be assured your hard work is still intact and in fact, the rest will probably result in even stronger muscles for both lifting and endurance. Once you are fully recovered. Until you are back to 100% health, just ease back into exercise. Rest when you need to but still bear in mind what Jim Rohn says about making miracles. The best thing to do is prepare for the hurdles you know to expect. This isn’t your first rodeo so you know to expect unexplained weight gain, illness, plateaus, family emergencies, work demands etc. Pre-plan your coping or mitigating actions when these occur. For work demands you may want to incorporate different ways to exercise while at work. What will you do if you hit a plateau? Do you know how to deal with a plateau? Have good goals and find out and have a plan in place before and of these happen. One of the best things you can do to assure your long-term success is to set clear long-term goals. Be clear in why you want to have this goal and a strategy to change the things in your life that aren’t in line with these goals. Find things that will make it easy to look forward to exercising, like meeting your friends there, or being able to listen to YOUR music while you are there. I use the time to listen to audiobooks. Life is often too busy to take the time to read but having a mystery read to you is an awesome experience. I won’t allow myself to listen to the book unless I am working out. I like the mystery books because they are always suspenseful and leave you wanting to hear more.